Hello and welcome to day 4 of my Altenew Week here on my blog. 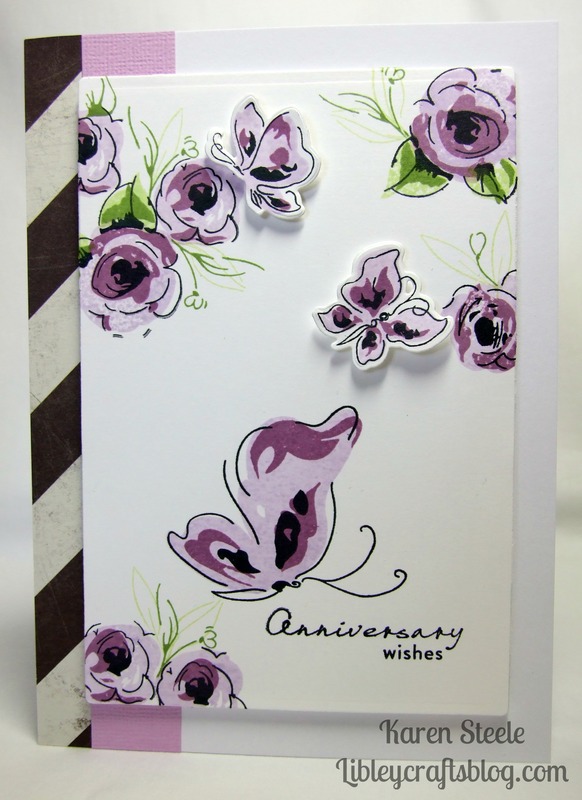 Today’s card is one that I have made for my brother and sister-in-law for their anniversary in May using Painted Flowers and also Painted Butterflies stamps and dies. I love the butterflies but just die-cut 2 and popped some foam tape on the back for some dimension. I also used Memento ink pads: Tuxedo Black, New Sprout, Bamboo Leaf, Lulu Lavender and Sweet Plum. The strip of lilac cardstock is American Crafts and the stripe paper is from my stash but can’t remember who by! The sentiment is from Waltzingmouse Stamps. Hi Karen, love your card. I have to confess I have never heard of Altenew so was intrigued. Where do you get them from? Another lovely card show casing the beautiful Altenew stamps…so pretty in purple! Your brother and sis-in-law will love this gorgeous anniversary card! Happy Anniversary to them! I love the butterflies – I am amazed at how many different and beautiful cards this one set has produced – I think I need it!! Thanks for the inspiration! I love that you added strips of paper and how they pick up the colors of the flowers and butterfly. A very special card for a special couple. another beauty, Karen! Love the purples!!! You are on a roll with these new stamps!